My health crazes come in waves. I make secret promises to myself every now and again that I’ll juice everyday and incorporate at least one raw ingredient at every meal. Sigh. Then that ‘sort your life out’ urgency surrounding New Years, or most recently back-to-school, wears off and I’m back to quick hunger fixes that are not always the healthiest choices. So here we are. School is in full swing. Days are long and hectic. Weeknights are way too short, and weekends are lightning fast. My menu goals have once again degenerated from lofty meal plans filled with raw foods and special recipes to the quickest grab and go recipe I can make, usually with whatever hodgepodge of ingredients I still have on hand. But sometimes, in the midst of all of the work week chaos and the lazy girl meals I resort to, I find a happy place. A place where my lazy girl, work week meal is actually super healthy. Enter the sauerkraut sandwich. So putting sauerkraut on a sandwich is as American as, well, it’s as American as a hot Reuben. When I was a kid, my parents used to drive us over the Williamsburg Bridge and head up to Madison Ave. in Midtown. There was this deli there that was famous for their Reuben sandwiches. In fact, I think the place might have been called Reuben’s Delicatessan. Whatever the place was called, they seriously had some bangin’ reubens. Corned Beef, sauerkraut, Swiss cheese, and Russian dressing on rye bread. A beautiful representation of the diversity of America, totally unlike this recent wave of venomous xenophobia we’ve seen infecting the headlines. #NoFascistUSA. Ahem, I digress. Anyway, Reubens were one of my favorite sandwiches when I was still a meat eater, and as a vegetarian, I’ve often used those favorite, childhood recipes to inspire the recipes I create today. 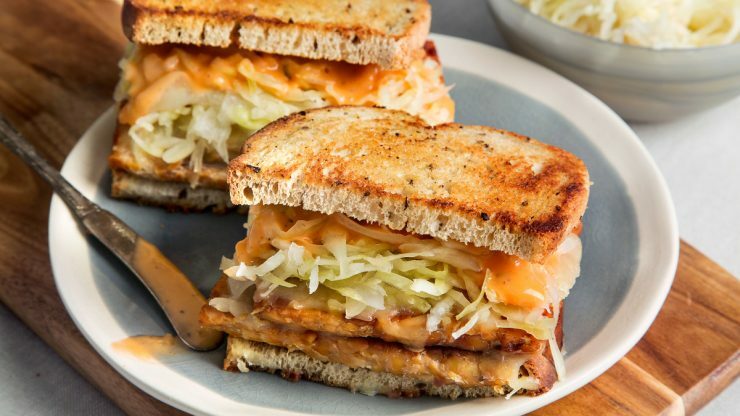 This sauerkraut sandwich recipe is totally inspired by those classic Reubens I loved as a kid. Okay. So I’m gonna tell you what this sandwich is all about, but you gotta promise you’ll at least try it. Pinky swear, because this right here might be a giant leap of faith. On paper these ingredients listed together won’t sound all that tasty, but I just need you to let me guide you through this. 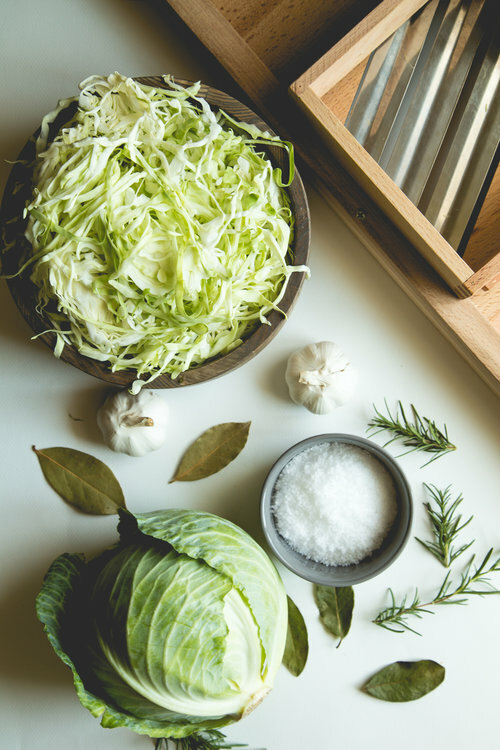 The two main ingredients are sauerkraut and almond butter. Seriously, you guys! Keep reading! I promise it works. For those of you that don’t really like sauerkraut, let me try to set your mind at ease just a little bit. I don’t go crazy for sauerkraut either. I mean, it’s okay, but honestly I could do without it. I’m not all that into almond butter either. Again, it’s good, but not to die for. You have to trust me when I say this though… the two combined make for one of the most divine, yet healthy sandwiches you’ll ever have. Leap of faith for sure. You must try this!!! close your sandwich and dig in!